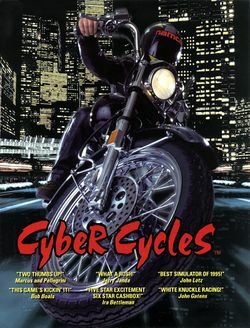 Cyber Cycles is a racing arcade game that was released by Namco, in 1995; it runs on their System 22 hardware, and allows up to four people to play it simultaneously when two two-player cabinets are linked together. Players can choose from three different types of motorcycles (the Anthias for novice players, the NVR750R for amateur ones, and the Wild Hog for expert ones) - and there are also two hidden motorcycles, the NVR750RSP and Another Anthias, that players may activate by entering a code into the cabinet, which varies based on if they are red (1P) or yellow (3P), or black (2P) or blue (4P). The CPU-controlled green motorcycles in this game are also based on the cycles from Suzuka 8 Hours (1992) and there are two different circuits to choose from (Green Hill, which is named after one of the circuits from 1993's Suzuka 8 Hours 2 and aimed at novice players, and Neo Yokohama which is aimed at expert ones) along with seven background music tracks (four on both circuits, but the fourth for both is "New Music"); there's even a Ridge Racer-style view change button that allows the players to switch from third-person to first-person view (and back again), and four different best-time tables (two for each circuit, with the first being for solo play, and the second being for link play). This page was last edited on 12 February 2017, at 11:00.